Cyber risk and insurance continue to gain momentum. More companies realize they need it. And insurers are expanding coverage – and enjoying profitability. That said, cyber insurance continues to be an especially risky insurance line. 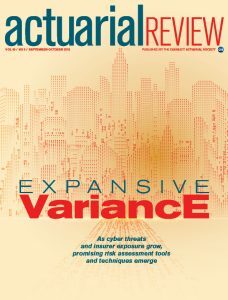 This is part of what I discuss in my recently published article, “Expansive Variance.” Published in Actuarial Review, I titled the article very deliberately. The variance of risk expands in new ways every time I investigate cyber risk and insurance. And frankly, the more I learn about cyber risk, the more concerned I become. Cyber risk and insurance are expanding. 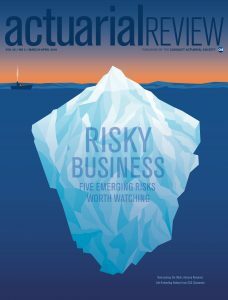 My article digs into the reasons behind the growing risk and new tools for actuaries and underwriters. Two particular trends stick out. First, Internet of Things technologies continue to introduce vulnerability to cyber attacks and personal privacy. Perhaps the best example of hacking through via app is last year’s Facebook data breach. Meanwhile, the bad guys, who have the creativity to walk the gauntlet of cyber protections, are quite innovative. Last year’s Equifax breach, the largest in United States history, is a case in point. Despite tight cybersecurity, the breach pulled the personal data of more than 145 million Americans in a seven-week period. Another attack, less widely known to consumers, turned off factories and interfered with commerce all over the world. The bad actors are also discovering ways to deploy artificial intelligence to mask coding to reach directly into personal computers. And for the less innovative, the old-fashioned and tried-and-true attack methods, such as email phishing, remain effective. Many companies still need to get religion on cybersecurity. Hackers are sometimes getting away with their dirty deeds because companies do not keep up with security patches. These breaches serve as warnings of what could come. Everyone who knows about cyber risk and insurance fear “big one” — that cataclysmic breach that could put the world on its knees. Insurers are also very concerned about it, spreading risk across individual industries to reduce exposure. The article also describes the unique challenges insurers are facing beyond cyber risk itself. Currently, cyber insurance is generally profitable. The market is so competitive that it is sometimes underpriced. Executives of non-cyber insurance lines are also concerned that their coverages are picking up cyber loss. Insurers have very different philosophies on covering cyber risk. For Warren Buffett, chairman of Berkshire Hathaway, Inc., cyber risk and insurance just too risky. He believes that each year carries a 2% chance of a super catastrophe costing $400 billion or more in insured losses. Not surprisingly, his insurance group is mostly staying away from covering cyber risk. But there’s plenty of insurers – about 170 depending on classification – which are happy to offer cyber insurance. AIG and Chubb are two examples. Insurers also have more insurance scores for cyber risk than ever before. Depending on the product, such cyber scores can evaluate risk potential by company and can watch how the risk changes. Consumers have little remedy when personal data breaches occur. Cyber insurance covers cybersecurity protections for a limited amount of time, say two years or so. However, there is nothing that can be done to get the information back. The bad guys have it forever. Thankfully, cyber insurance for individuals is just starting to become available. Last week I attended a seminar on protecting personal privacy sponsored by the Atlantic magazine and Salesforce. Speakers discussed a social contract, which presumes entities collecting our data will protect it. However, this social contract has little law to support it. One privacy attorney says that the Facebook breach, while unethical, is not illegal. Americans assume the government is making sure our data is respected and kept private. But in truth, our public policymakers are behind the curve. As someone at the seminar joked, “Europeans regulate what Americans innovate.” Legislative remedies are being considered by Congress. During the seminar, Senator Mark Warner (D-VA) mentioned a recent hearing where the nation’s largest search engine’s representatives were notably absent. The company, however, is showing up to help China with their internet although its employees are protesting and some have quit. This is the country that is following every move of their citizens to determine their “trustfulness” and is also blamed for particular cyber breaches. My article describes new regulations from the European Union that affect American companies. California also passed an aggressive law to protect consumers. It goes into effect January 1, 2020. Not surprisingly, technology companies are fighting the restrictions the new law will impose. After all, they need personal data to sell ads. The European and California laws have potential ramifications for cyber insurers, but those details are yet to come. Note: My last article about cyber insurance discusses particular challenges for actuaries. To see more of my cyber articles, just enter “cyber” in the search bar below. The CATs of 2017 are warning us, will we listen? There is a lot to learn from the weather CATs of 2017. 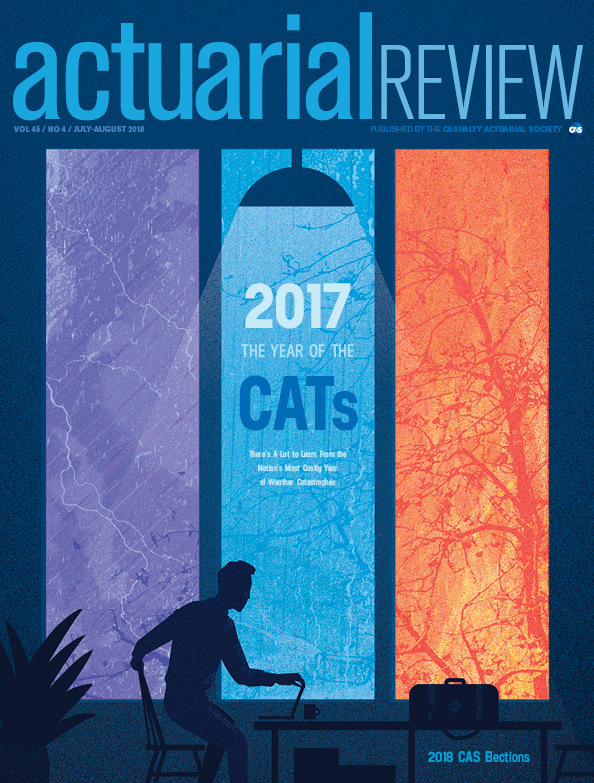 My most recent article, 2017-The Year of the CATs, published recently in Actuarial Review, covers natural catastrophes Hurricanes Harvey, Irma, Maria and last fall’s combined California wildfires. The article also takes a unique look each CAT, showcasing lessons learned and ones yet-to-be learned. Combined, the 2017 CATs offered unique challenges. For example, insurers experienced higher loss adjustment expenses because the three major hurricanes took place within six weeks. On the positive side, insurers and reinsurers also developed new ways to work together to quickly pay claims. New insurer efficiencies are great for policyholders. However, the CATs are a reminder of the nation’s chronic problem of the uninsured or underinsured. The major CATs of 2017 cost $306 billion in losses — the largest amount of weather-related economic losses in United States history. Insurers, rather than property owners and the government agencies, could have carried a greater portion of the cost. Sadly, it is not surprising to see the high percentages of residential properties in hurricane vulnerable areas lacking flood coverage through the National Flood Insurance Program (NFIP). Coverage participation in the federal program has always been a problem. Even when NFIP policyholders and taxpayers help subsidize premiums for affordability, too few still purchase it. To make matters worse, it is common for homeowners insurance policyholders to believe flooding due to weather is covered. Generally, it is not. Ironically, the wealthy know insurance is a good bet. After last year’s wildfires in California, property owners are rebuilding homes after filing claims at $1 million a piece! But there is also a deeper lesson. Experts predict future CATS can be more damaging and dangerous. Since there is no negotiating with Mother Earth, it is time for some tough love. Building in potentially dangerous areas must stop. Consider Hawaii’s Big Island this year where paradise turned to a fiery hell. Hedging their bets, people built in harm’s way despite warnings. As a generous lot, Americans rightly open our hearts and wallets to help victims. Now they need to live on safer ground. Financially helping property owners in vulnerable areas to move is one possibility. While the idea makes me wince for several reasons, the big short-term cost would save lives and promises to be less expensive in the long term. As my Actuarial Review article concludes, the CATs of 2017 call us to prepare for the CATs of tomorrow. Beside relocating people from vulnerable areas, I believe the CATs of 2017 should also mean broadening the definition of environmental sustainability to include building structures that will last the test of time. The environment will be better off when we reduce the use of the earth’s resources for rebuilding in CAT-vulnerable areas. Accused of being an idealist, I see a potential future when a home’s value is not about landfill-bound luxuries, but its structure for strength and sustainability. A “smart home” could mean residential structures built to withstand the test of time rather than those featuring technological Internet of Things gizmos that can increase vulnerabiilty to another risk: cyber attacks. It can be done. Changing the American mindset towards littering and recycling en masse is one example. Growing up in the 1970s, I remember people thoughtlessly threw their garbage out of their car windows. Highways, once lined with nasty debris, are much cleaner now thanks to public awareness and fines for littering. Recycling was considered a huge bother 25 years ago but now Americans do it without giving it a second thought. If awareness can inspire people to stop littering and start recycling, then it is possible to change the perception of what makes a home valuable. Changing perception requires a consortium of citizens, insurance companies, politicians and governmental agencies that can wield an effective public awareness campaign. By saving lives, the environment and money, the effort would be worth it. There is no proof that driverless cars will be safer than human drivers. I found myself saying that aloud to a radio ad yesterday. In explaining his support for driverless car experimentation in Michigan, Governor Rick Snyder notes that 94% of accidents are caused by human error. The implied assumption is that driverless cars will be safer. There’s no proof that driverless cars will be safer than mere human beings. This is just one of the critical issues concerning driverless cars I discuss in my most recent article, Driverless Utopia. Besides delving into driverless car safety, the piece also cites new risks driverless cars can introduce, such as vehicular hackability as well as liability issues. 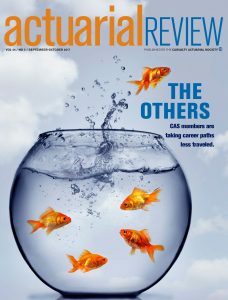 As the cover story for the May/June issue of the Casualty Actuarial Society’s Actuarial Review, it offers the critical perspective of actuaries. Their rubber-hits-the-road view deserves more attention because actuaries anticipate risk potential when determining insurance rates. Actuaries who looked into the 93% statistic, which is based on a 2008 National Highway Traffic Safety Administration (NHTSA) study, conclude that 78% of accidents – not 93% — are due to human error. The article dives into the actuarial analysis even more. There is no national clearinghouse tracking data regarding driverless car safety. Basic information, such as fatalities and accidents related to automated technology, is not publically available in one place. 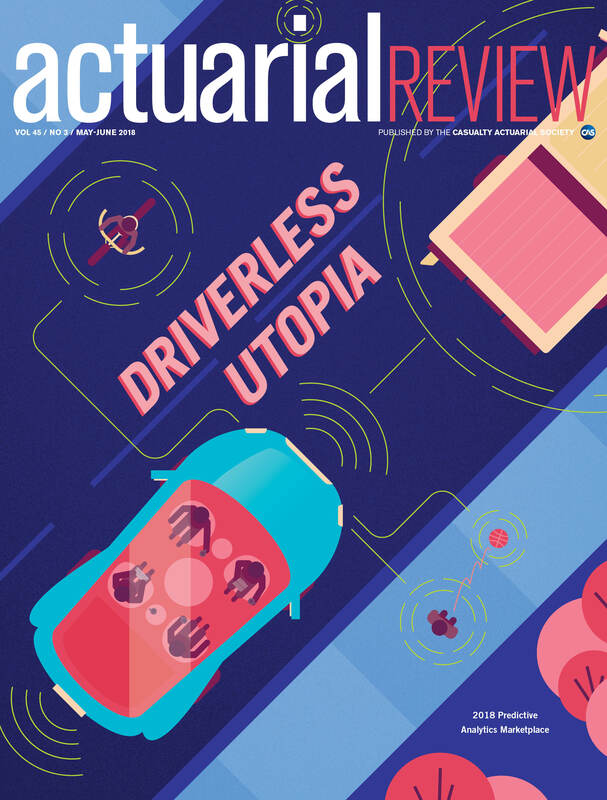 Actuaries want driverless car manufacturers to share data so insurers can anticipate the risk insurers cover. That is not happening. The lack of apples-to-apples comparisons between driverless cars and human-driven conventional vehicles in similar scenarios. Existing research considers different issues. And the conclusions vary. Further, driverless car experiments are taking place in near perfect driving conditions where accidents are less likely anyway. Also, since automated cars cannot handle inclement weather or a quick Bambi crossing, imperfect humans who take the wheel can still be at fault. The pass off risk between automated systems and human drivers is huge for determining safety and liability. That point of transition, when automated vehicular technology senses danger and mere humans have to take control is fraught with problems. Driverless cars might decide who dies. One study shows the cars favor saving younger people rather than the elderly. Finally, as my first driverless car article notes, if driverless cars are safer than human drivers, it is likely because the car will be programmed to follow traffic laws – to the letter. Lower the speed and the accidents decline, even when people are driving. I’m not against driverless cars. However, I am troubled by rhetoric that presumes driverless cars will be safer without sufficient proof. The logic that driverless cars will be safer because human error is the primary cause of accidents is faulty and misleading. The safety issue might not matter anyway. In the next 10 to 15 years, I believe the average consumer will be depending on taxi-like automated vehicles, figuring that cars are risky no matter who – or what – is driving them. And since the cars will be in a constant state of technological improvement for at least the next couple decades, they will be too costly for average consumers to own, insure, maintain and repair. Already, minor fixes, such as replacing a driver’s side mirror, cost more than the typical $500 insurance deductible due to all the connecting sensors. My hope is Americans and public policy makers will demand greater transparency from technology companies. Automated vehicle technology is just one more area where consumers should know more. Insurers are beginning to introduce rising sea levels into rates, according to my latest article, “The SLR Factor: As sea levels rise, the flood risk equation changes.” It was published recently in the Casualty Actuarial Society’s Actuarial Review magazine. The National Flood Insurance Program (NFIP), the nation’s largest insurer of homeowners’ flood insurance, is beginning to factor in sea level rise. So are excess insurers and reinsurers. However, rising sea levels could also affect the appetite for private homeowners insurers looking to compete with the NFIP. While the “21st Century Flood Reform Act” is yet to pass, the omnibus budget bill signed by president Trump last Friday allows NFIP’s reauthorization. The controversial budget bill gives the Federal Emergency Management Agency (FEMA) a necessary financial boost for mapping and mitigating flood risk. For the scoffers who do not take rising sea levels seriously, consider places such as New Orleans where land is subsiding. Or Norfolk, Va. where rising king tides flow onto nearby streets. A single drop of rain, by the way, does not cause these tides. Instead, they happen when the earth makes its predictable pull with the sun. What are the implications for rising sea levels? Covering homes and businesses near the East and Gulf coasts will become more expensive. Some owners will likely have to abandon their property to the tides. This has already happened in New Orleans. Flood exposure will spread, affecting properties once believed to be lower risk. It also means changing weather patterns that will introduce more potential catastrophic weather events. Even if sea levels remain stable, there are still too many properties not covered for weather-related flood damage. Why? Because many homeowners fail to realize that their insurance generally covers flooding caused by something inside the house, such as a leaking pipe. People believe they do not need flood coverage from the NFIP until it is too late. And some irresponsible residents count on FEMA to bail them out instead of buying coverage from NFIP. And don’t think your property is safe because a FEMA map says so. As I explain in a previous article covering the NFIP, many maps are out-of-date. Further, specific property details can be more critical than zone location. 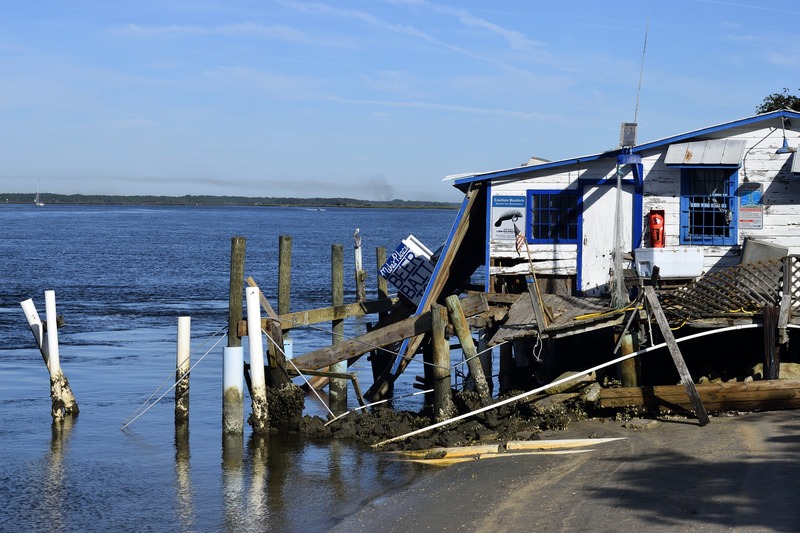 Rising sea levels will affect more property owners. Insurers are preparing, shouldn’t you? Successful actuarial consulting depends on effective communication. At some point, most actuaries consider a career in actuarial consulting. It’s easy to see why. Generally, the variety of projects are interesting and the pay is better. But as my recently published article, “More Flexible” explains, actuarial consulting is not for everyone. Success requires a variety of additional skills beyond impressive mathematical and statistical chops. You can find the article in Contingencies’ Actuarial Job Seeker supplement, which is published by the American Academy of Actuaries. My goal was to write the most comprehensive and useful article on the subject. I believe it is a must-read for actuaries who want to take the plunge into actuarial consulting. As the article says, excellent communication skills are necessary for actuaries who want to climb up the consulting ladder. In this blog, I share my observations based on nearly 30 years of experience working with actuaries as a marketing and communications consultant as well as a reporter. Granted, how much actuarial consulting work involves communications and marketing skill depends on the position and the firm’s size. That said, sooner or later, most actuaries are called out of their comfort zones to engage in marketing and sales. I find that actuarial consulting firms miss opportunities to reach their intended audiences due to ineffective communication on multiple fronts. A client once paid me to interview buyers of actuarial services. They told me what kind of content they seek from marketing materials to reach a decision. The client resisted, and the great marketing plan never happened. The greatest challenge, however, is making actuarial information meaningful to lay people. Like researchers, they can get too wrapped up in the technicalities without showcasing the results that matter most to the lay people they need to reach. That includes everyone from insurance executives who hire actuarial firms to influencers such as reporters. It’s also critical for those in actuarial consulting firms to keep an outsider’s perspective. To the non-actuary, actuaries and actuarial firms can appear the same. All actuaries are credentialed and adhere to the same actuarial standards of professionalism. The services appear to be the same. to engage in marketing and sales. Therefore, actuaries must be able to explain to potential customers – whether interpersonally or through marketing materials – why their loss reserving service or predictive modeling prowess is the most desirable. Communications and marketing professionals can be a big help if they can translate actuarial analysis, reports and studies into layperson-friendly content. However, the less the communicator understands insurance and actuarial products, the more the likelihood of missed opportunities. Annmarie loves actuaries! Find more actuarial content by clicking here. The Insurtech Revolution is here. 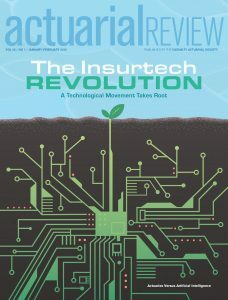 My most recent Actuarial Review article, “The Insurtech Revolution,” cuts through the buzz and highlights areas where insurtech is likely to transform the insurance industry. Insurtech is like any quickly emerging development. There is a lot of activity, confusion and a dash of hype. That’s why my first question to most sources was this: “What is the difference between technological innovation and insurtech?” They agreed it was a good question. The evolving broad definition of insurtech risks becoming too general to be useful. The article includes an important sidebar that further defines the term. I hope will encourage more informed insurtech conversations. This is certain: insurtech is not a Reese’s Peanut Butter Cup. Insurtech does not merely stuff new technology into insurance. Rather, insurtech is a cottage industry coming into its own. At its best, insurtech challenges insurers to re-think what insurance could look like and how it should be delivered and serviced in a digital economy. My concern is that the most cautious insurance professionals among us will be too quick to write off insurtech as a fad. Or even worse, they will choose denial or ignore it to their peril. Insurance professionals must pay attention to insurtech because it will affect their jobs. Meanwhile, its emphasis on artificial intelligence and other smart technologies will change and eliminate jobs. Insurtech companies offering insurance can, for example, prefill personal information through an Application Programming Interface (API), simplifying the application process practically down to a few digital taps. By programming a rules engine, artificial intelligence is already performing critical functions, such as statistical calculations and ensuring accurate and meaningful customer information. 1) Insurtech companies risk operating under false assumptions. A technological improvement in one industry is not necessarily easily translatable to the insurance domain. The transactions, responsibilities and public accountability differ from banking, as an example. 2) Insurtech companies are in love with their beloved technology, but insurers love real results. Understand the real problems the insurance industry is facing. Offer solutions using insurance industry lingo. Save that technological deep dive for those who want to go there. 3) Insurance companies are not threatened by insurtech competitors, also known as “disruptors,” which have garnered an overabundance of media attention. Peel back the artificial intelligence, APIs and novel approaches to coverage – and you have the excitement and struggles of a new insurance company. In three years or less, Flo, the gecko and/or other insurers will be using the insurtech bells and whistles that make sense. And they will be doing it better. By that time, we’ll also know if the “disruptors” are profitable. The Insurtech Revolution is here. Please check out my article and offer comments below. Actuaries applying advanced analytics in non-traditional insurance roles are deploying their acumen to solve business problems. Actuaries applying advanced analytics provide a window into the profession’s future. Part II features four actuaries applying advanced analytics in very exciting ways. It provides a window into the future of the actuarial profession. Increasingly, actuaries will be serving in roles beyond pricing and reserving. As technology moves forward, advanced analytics and artificial intelligence will become more commonplace, offering new potential roles to actuaries. Kevin Kuo, Software Engineer, RStudio After serving as a life actuary, Kuo applied predictive analytics for direct mail credit card acquisitions for Citibank. He’s now working to enhance “R” software to offer big data and deep learning capabilities. Aaron Fezatte, Strategy Manager, Expedia. Beginning his career as a P&C actuary for Liberty Mutual, he secured a job with Expedia to develop new ways to price and offer travel insurance. Cathine Lam, Data Scientist, Economics & Actuarial Team, Metabiota. The former Milliman Inc. consultant works to track infectious diseases around the world and supports her company’s software product. Insurance companies and government entities are key clients. Frank Chang, Director of Insurance and Safety Analytics, Uber. Chang wrote for The Motley Fool and handled pricing for Esurance before working for Google and then joining a team at Uber. His multifold role includes applying analytics to encourage risk management and insure Uber drivers. 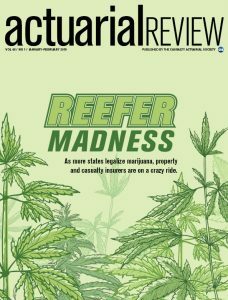 The first article about “the others,” published in the September/October edition of Actuarial Review, was highly popular, attracting hundreds of visitors. This second and final article is a must read because it showcases how actuaries applying advanced analytics and forging new pathways for the profession. During the past few years, I’ve written several articles about advanced analytics and the actuarial profession. If you would like to check them out, please visit the actuarial section of this blog. My next Actuarial Review article covers insurtech. Slated for early January, it explains how and why insurtech will be changing the insurance value chain – forever. 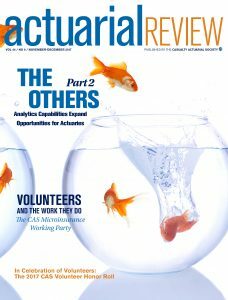 My latest Actuarial Review article profiles property-casualty actuaries forging non-traditional career paths. Actuaries forging non-traditional career paths. To write the article, I went through a list of members of the Casualty Actuarial Society who are not working for insurance companies or serving as consultants. This list features about 3 percent of the CAS’s membership. Sharon Carroll who applies her actuarial experience to improve management of hospital expenses to achieve work/family balance. Bill Wilt who started a new company that publishes unique insurance-related research. Robert Anderson who, with his wife’s encouragement, became an in-house actuary to develop fresh approaches to insuring a major corporation. Mike McMurray who runs a minor league baseball team due to him and his wife’s shared passion for the game. The article also includes advice to property-casualty actuaries who also want apply their actuarial skills in non-traditional work settings. 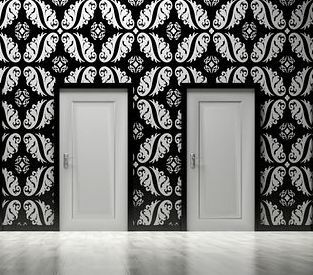 This is part 1 of a two-part series in Actuarial Review that covers actuaries forging non-traditional career paths. The November/December issue of Actuarial Review will also feature more property-casualty actuaries who are taking the career path less traveled.